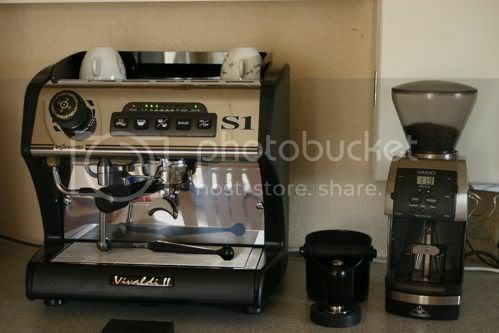 I got my La Spaziale S1 Vivaldi 2, for about a month ago. I was upgrading from ECM Giotto Classic, but i was not satisfied with the steam power. So i went the Dual-boiler-way.. I work as coffee-roaster and technician, at a little Micro-coffee-roasteri i Denmark, called Stellini. The LaSpaz arrived on a Friday, and i got installed in my coffeecorner.. But the steamboiler was not filling up.. The pump was running, but no water came through to the boiler. And the flowmeter fault appeared. I took the LaSpaz apart, and measurred it down to the mainboard, it did not switch the valve for the steamboiler on. I gently knocked the relays on the mainboard, and suddently the valve was working normaly. I put the LaSpaz backon, and everything worked. And i got the first espresso, at 1:00 am.. :) It was like heaven.. But now and then the fault came back, and i had to knock the machine.. I got in contact with La Spaziale, and the send me a new mainboard. So the La Spaz is now running 100 %.. And i am very happy, with the mashine..
Re: Steambolier not filling, at first run-up..
Glad to hear your problem was solved easily. If you still have the old board just resolder the relay contacts on the board & any others that look suspect & you will have a spare. Ooooooh, first Vivaldi and Vario combo. Damn.....knew it would look good. Gotta have one now for my decaf. Someone else going with the all "black and chrome" look. I bought a Vario from Chris about 3 weeks ago, specifically for decaf. It looks great next to my Mini but more importantly, I'm extremely pleased with its grinding ability . Chris is selling them for slightly under $400, which IMHO is a pretty good deal.